Creamy cheese grits swirled with brown butter and pumpkin; these Brown Butter Pumpkin Grits are amazing! I’m hanging on to Fall just a little bit longer, can ya tell? These pumpkin-spiked cheese grits are perfect year-round thanks to easy to store pumpkin puree, which can be frozen and defrosted as needed or plucked from your grocer’s canned food aisle. I’ve tried my hand at making my own (SO EASY using a slow cooker!) and also adore Publix-brand pumpkin puree. I love them with a little dash of sage or nutmeg thrown into the mix (choose your favorite!) and topped with a savory spinach sauce and some fried eggs. Frozen creamed spinach can make a speedy swap for the sauce if needed (jazz it up with some green onion and garlic!) and you can even empty our your crisper, adding chopped sautéed veggies to the sauce. Mushrooms are a fantastic addition! Creamy cheese grits swirled with brown butter and pumpkin, these Brown Butter Pumpkin Grits are amazing! Bring 2 cups broth [vegetable or chicken] to a rolling boil and add 1 cup old fashioned grits. Stir vigorously, then reduce heat to low and cover. Allow grits to simmer for 10 minutes, stirring occasionally. While your grits cook, brown your butter in a small sauce pot over medium heat. Let your butter melt untouched, then once it starts to simmer and brown, whisk constantly until butter is golden and fragrant. Remove from heat. Once the grits absorb the broth, add milk and pumpkin puree. Season to taste with 1/8-1/4 tsp salt and a pinch of dried sage (or nutmeg; both taste fantastic with pumpkin!) and continue to cook on lowest setting for 5-10 minutes. Lastly stir in 4 oz freshly grated cheddar cheese along with your browned butter and adjust seasoning to taste. FOR THE SAUCE: saute spinach and garlic in butter, then add half and half (or milk/cream combo) and green onion and reduce heat to medium-low, allowing the sauce to reduce and thicken, stirring occasionally. FOR THE EGGS: fry them up in a little bit of butter, cooking the yolks to your perfect degree of drippiness. Paul likes his extra runny while I like mine firm, and fried on both sides! READY? 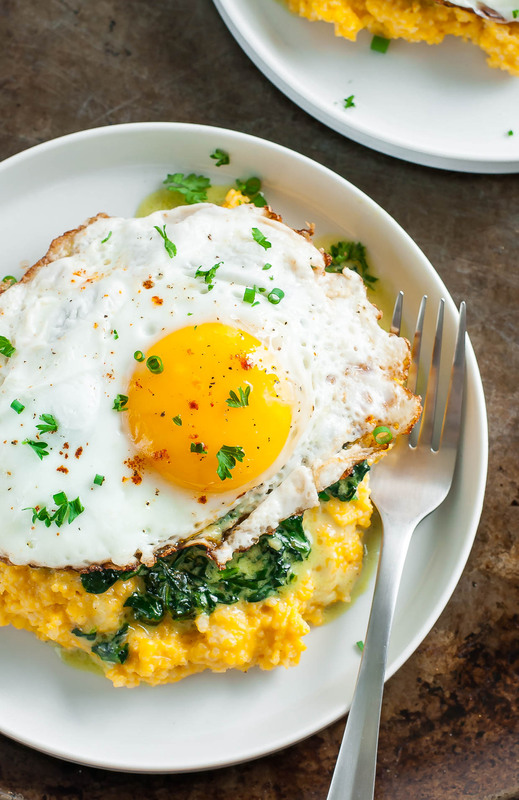 Spoon the spinach sauce over your grits, stack your eggs on top, and dig in! optional garnish: chopped parsley and/or green onion; you can even get crazy and add a little freshly grated parmesan cheese - YUM! 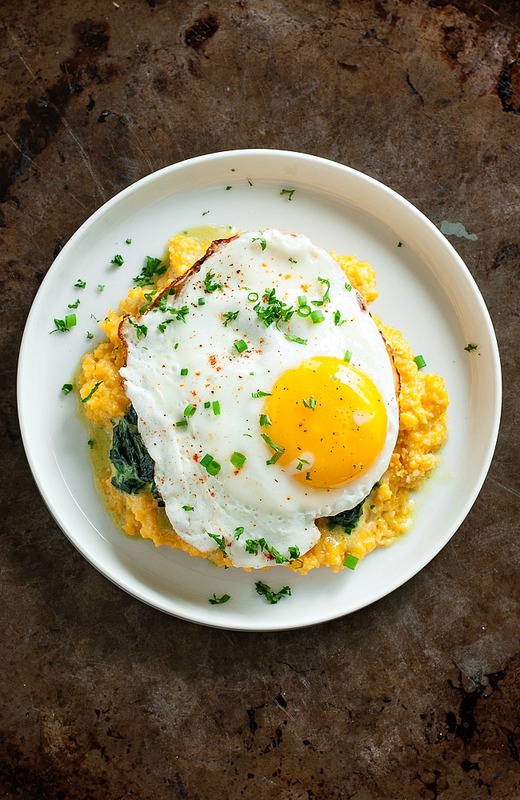 These brown butter pumpkin grits are fantastic! 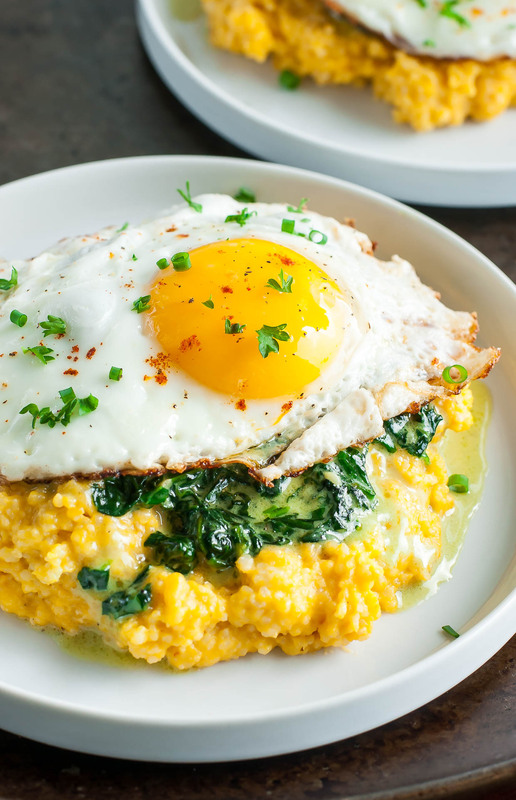 Hope y’all love these gorgeous golden cheese grits as much as we do! I have it on good authority that leftover pumpkin grits are AMAZING with shrimp! Sauté shrimp with cajun seasoning, minced garlic, and enough butter to make them saucy then serve over warmed grits. To reheat the grits, warm them up via stove-top or microwave with a little bit of milk and you’re good to go! I am a Southerner, so I grew up eating grits in many forms, but never with pumpkin. I made this recipe this morning and I must say, these are the best grits I have ever eaten, and I am in my 60’s! Thank you for sharing a great recipe. What a great recipe for fall! Can’t wait to try it. My mouth waters just from looking at this colorful dish. The egg yolk is so bright and appetizing ! Thanks Brandi! Get your pumpkin on! I never would’ve thought to add pumpkin to grits! Great idea, I love this flavor combination. It’s so dreamy, right?! I don’t bake with pumpkin a lot but I loooove it in grits! The only thing I changed was to add some bacon (cut up small). It was a good addition. We all loved it! I’m going to try it again with butternut squash since I don’t have pumpkin right now. Thanks for such a wonderful recipe! OMG, this looks SO good. I love the combination of pumpkin and brown butter, and that egg looks perfect. Breakfast for dinner …. yup, that’s what I’m thinking I’ll need to have tonight. That plate looks too good to resist. Oh my goodness, this. is. awesome.! I love everything about this recipe, what a delicious way to utilize pumpkin! 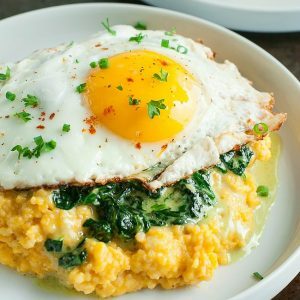 I’ve never made grits, but this makes me want to try! I wonder if you can brown ghee the same way you brown butter? I’m not sure! I usually keep my ghee separate and use regular butter to brown. Finally a pumpkin recipe I’d actually consider. Now I just need to get around to roasting and pureeing all those squashes hiding out in my basement. Oh totally, fried eggs for life! Though if I had my way I’d top scrambled eggs with fried eggs and call it a (crazy) day! Haha! Well these couldn’t possibly sound any more delicious. Yum central. 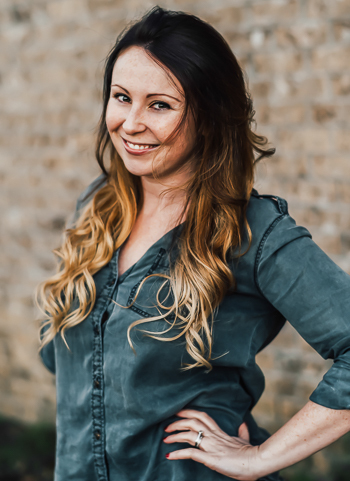 Nice work, Jenn!